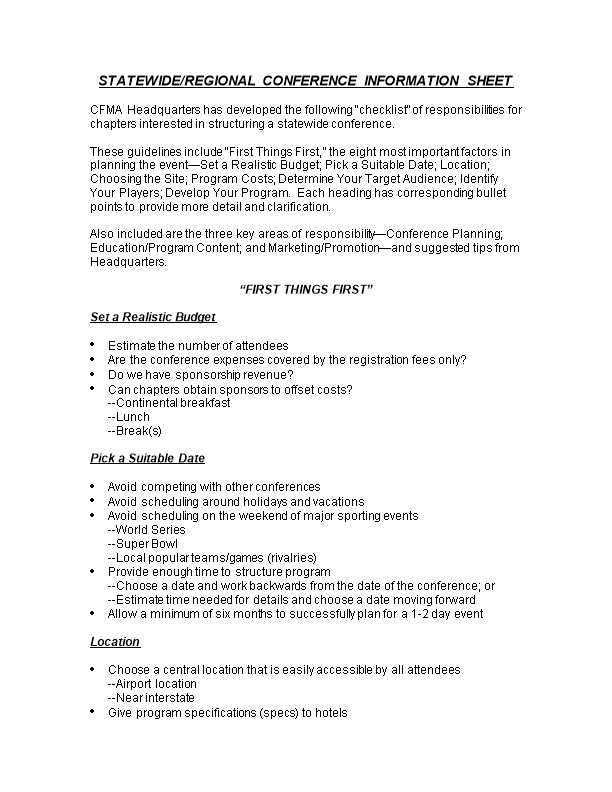 CFMA Headquarters has developed the following “checklist” of responsibilities for chapters interested in structuring a statewide conference. These guidelines include “First Things First,” the eight most important factors in planning the event—Set a Realistic Budget; Pick a Suitable Date; Location; Choosing the Site; Program Costs; Determine Your Target Audience; Identify Your Players; Develop Your Program. Each heading has corresponding bullet points to provide more detail and clarification. Also included are the three key areas of responsibility—Conference Planning; Education/Program Content; and Marketing/Promotion—and suggested tips from Headquarters. Are the conference expenses covered by the registration fees only? Do we have sponsorship revenue? Can chapters obtain sponsors to offset costs? --Is a room block needed? --Is there a fee for not meeting room block total? --Is there a room rental? --Can venue accommodate your needs? --Are there enough meeting rooms? --Is there one overall fee? --Based on number of speakers? --Is liquor by consumption or per drink? --Will venue use top brand names? --Will it be open bar/cash bar? When does the hotel need the final room block? --Will your group have its own dedicated hotel contact? --Are there any “hidden” costs? --Other room charges (health club, telephone, etc.)? --Are they included in registration fee or separate fee? --Mailed first class, third class, or bulk rate? --Should food/beverage totals be adjusted? Was there enough sponsorship revenue? DISCLAIMER: The above information is to be used as guidelines only. (CFMA Headquarters assumes no responsibility for inaccurate/erroneous information). Please contact Mike Molaro, Director, Chapter Services, if you have any questions or concerns.